My name is Ashton. 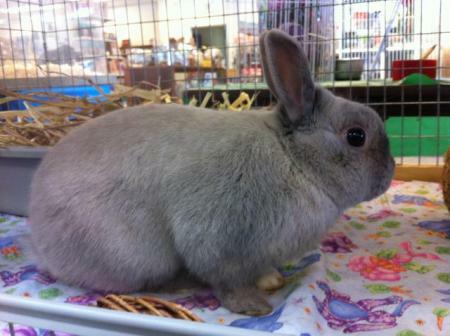 I’m a neutered boy mixed dwarf bunny. I am about 1 year old with lots of energy and curiosity. I am a little shy initially as I’m small and I need to learn to trust you before we can be friends and play I warm up quickly. I like to play with my cardboard toys and anything I can toss or have fun with. I like the houses with door and windows. I like things I can run and play in like an agility course. Yes! I enjoy fresh Italian parsley and other wet delicious greens. I’m a good hay eater too. I love to exercise and play. I do have a very mild incisor teeth malocclusion. Right now my teeth line up well so I don’t require regular vet visits for a trimming. I have to avoid hard wooden toys, so as to prevent any future damage to my front teeth. That doesn’t mean I’m less loveable though, so please do adopt me. Make me part of your family. I won’t disappoint you. I'm currently located at Andys Pet Shop in San Jose, CA, which shows rescued animals only.